Folks will remember the terrible destruction of the tornadoes that hit communities in Oklahoma on May 20th ... but much closer to home for us was the tornado that hit the small community of Mt. Olive, Illinois, about 50 miles from Greenville and within the Owl Creek Gazette's distribution area. The National Weather Service confirmed an EF2 tornado had ripped through the Mt. Olive severely damaging homes and businesses. One of the hardest hit was the family of Lisa and Steve Werner. 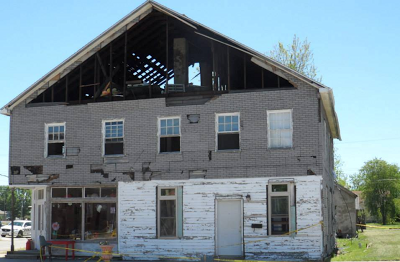 The couple ran two small businesses on the first floor of their building and lived, with their 12 year old daughter, on the second floor. The Werners were home when the twister hit. The tornado badly damaged the structure and has left the family currently homeless, though grateful to be alive! With no insurance, the family is struggling, to say the least. For those wanting to help the Werner family, a trust account has been set up at the First National Bank in Staunton, IL. No account number is needed. Make the check payable to Steve Werner. 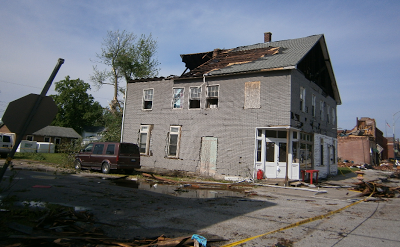 Below are photos of the damage to the Werner home and business. 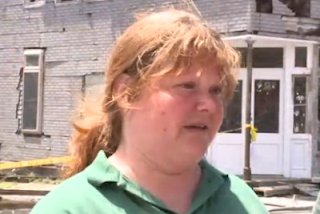 Lisa Werner in front of her tornado damaged home and business. in the June issue of the Owl Creek. Gazette.